A plaque commemorates 50 years of the establishment of the park. 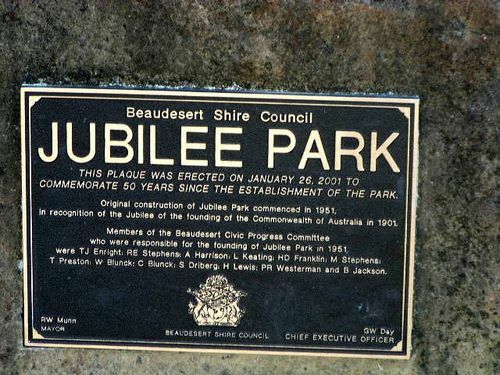 Jubilee Park was established in 1951 in recognition of the Jubilee of the founding of the Commonwealth of Australia. This plaque was erected on 26 January 2001 to commemorate 50 years since the establishment of the park. Original construction of Jubilee Park commenced in 1951 in recognition of the Jubilee of the founding of the Commonwealth of Australia in 1901.